Key-value stores’ fast read capabilities stem from their use of well-defined keys. These keys are typically hashed, which gives a key-value store a very predictable way of determining which partition (and thus server) data resides on. A particular server manages one or more partitions. A good key enables you to uniquely identify the single record that answers a query without having to look at any values within that record. A bad key will require that your application code interprets your record to determine if it does, in fact, match the query. If you don’t design your key well, you may end up with one server having a disproportionately heavier load than the others, leading to poor performance. Using the current system-time as a key, for example, pushes all new data onto the last node in the cluster, which leads to a nightmare scenario of rebalancing. Partition design is important because some key-value stores, such as Oracle NoSQL, do not allow the number of partitions to be modified once a cluster is created. Their distribution across servers, though, can be modified. So start with a large number of partitions that you can spread out in the future. One example of partitioning is Voldemort’s consistent hashing approach, as shown. Here you see the same partitions spread across three servers initially and then across four servers later. 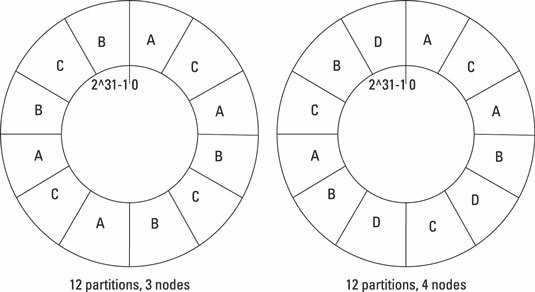 The number of partitions stays the same, but their allocation is different across servers. The same is true of their replicas. Key-value stores are highly distributed with no single point of failure. This means there’s no need for a master coordinating node to keep track of servers within a cluster. Cluster management is done automatically by a chat protocol between nodes in the server. You can use a trick in the client driver to squeeze maximum performance out of retrieving and storing keys and values — the client driver keeps track of which servers hold which range of keys. So the client driver always knows which server to talk to. Most databases, NoSQL included, pass a request on to all members of a cluster. That cluster either accepts the write internally or passes it one under the hood to the correct node. This setup means an extra network trip between nodes is possible, which can add to latency. In order to avoid discovery latency, most key-value stores’ client drivers maintain a metadata list of the current nodes in a cluster and which partition key ranges each nod manages. In this way, the client driver can contact the correct server, which makes operations faster. If a new node is added to a cluster and the metadata is out of date, the cluster informs the client driver, which then downloads the latest cluster metadata before resending the request to the correct node. This way maximum throughput is maintained with a minimum of overhead during development. Another side benefit is that there’s no need for a load balancer to pass queries on to the next available, or least-busy, server — only one server (or read replica server) ever receives a client request, so there’s no need for load balancing.